It is a low cost hardware platform which allows ClearSkyLab to propose products at a reasonable price to the amateur astronomers. Now that the Crowdfunding phase is complete, when will the first version of the AstroPiBox be available? The AstroPiBox team will in a first time collect the feedback from the Crowdfunding users and possibly implements changes and fixes. We think that we will be in a position to propose the AstroPiBox during the Ciel en Fête event that will take place in Toulouse, France, on the 2nd, 3rd and 4th of June, 2017. The ASI120 does not work with the AstroPiBox. Is there a way to solve the issue? Some versions of the ZWO ASI camera firmware have a known problem regarding the USB protocol implementation. The recommendation from ZWO is to update the firmware with a compatible version. To achieve that, download the zip archive FWTool.zip on a Windows system, open the archive and extract it. Then plug the camera on your PC, launch the application FWupdate.exe and pick a compatible firmware (which ends with -compatible.iic) that corresponds to your camera. This should solve the connection problem on the AstroPiBox. How do you pronounce AstroPiBox ? It can be pronounced either the French way "Astro /pi/ Box" or the English way "Astro /pɑj/ Box" ! Is it possible to create a copy of the Micro-SD card? No, the Micro-SD card is protected and cannot be copied. In case of a problem with your card, simply return it to ClearSkyLab in an envelope and a new card will be sent to you. 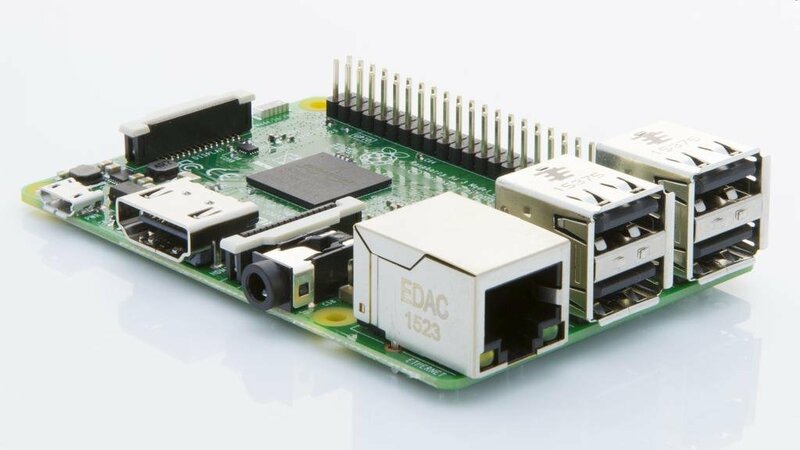 Can I use my Micro-SD card in another Raspberry Pi? Yes, the AstroPiBox software is only bound to the Micro-SD card, and it is possible to use it in a different Raspbery Pi 3. You can imagine for instance to have a TouchScreen configuration usage and to use the SD card in a fixed setup with an other Raspberry Pi. Will the software provided in the AstroPiBox evolve in the future? Absolutely! Nothing is frozen in the AstroPiBox, and we will make the software suite evolve over time, both for the open source software components (we have just updated CCDciel under the form of an update as an example) and the AstroPiBox software iteself. It is planned that the minor software upgrades will be done automatically over the Internet. For a major software upgrade in the future, the owners of the AstroPiBox will be entitled to an upgrade at a discounted price (only shipment costs for a Micro-SD card will be applied). What is the supported equipment for the AstroPiBox (cameras and mounts)? The general rule for supported equipment is the following: for an equipment to be supported with the AstroPiBox, it must have an INDI driver available and it must have been tested with an AstroPiBox configuration. The tested and validated equipment will be published on the AstroPiBox Web site. Some cameras might need a powered USB hub to work with the Standard version of the AstroPiBox, in which case this will be mentioned (it must be noted that the Advanced version of the AstroPiBox will integrate a powered USB hub). If your equipment is not mentioned, please contact us first. What is the position of the AstroPiBox team with regards to Open Source software? 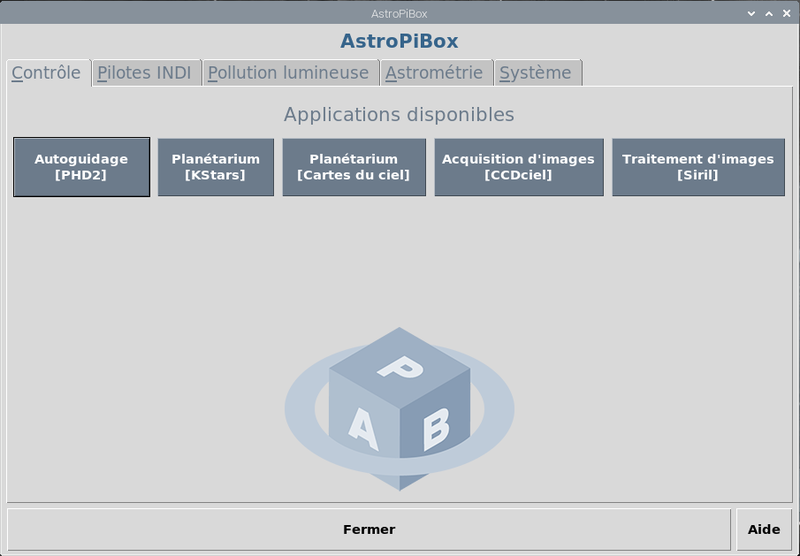 AstroPiBox integrates Open Source software (PHD2, Kstars, CCDciel and Astrometry.net as of today), which is allowed by the license of these software products. When changes are made to the code of these products, we follow the recommendations of the Open Source approach and we propose these changes to the Open Source community or we make them accessible to the public (this is the case for instance for the PHD2 code that has been modified to accomodate small screens, see the Support page). The AstroPiBox software itself stays the property of ClearSkyLab (for instance the software that simulates light pollution) and will not be published as open source. Why is there different delivery dates for the 4 versions of the product? The AstroPiBox SD version will be the first one to be released in February 2017. The reason is that an advanced version of the AstroPiBox software suite will be ready to be shipped earlier than the other versions that require an integration with hardware. It must be noted that an update of the Micro-SD card will be done at no charge (other than shipping) when the first definitive version of the software suite is ready a few month after the crowdfunding phase is closed. All what will be required is to ship the Micro-SD card back to us. The AstroPiBox Standard version will be realeased about a month later (March 2017) since we need to source the Raspberry Pi, perform the integration with a good quality case and identify the best power supply for the AstroPiBox. The AstroPiBox Advanced version requires the development of a custom case and an electronic board in order to integrate the various components of the system (powered USB hub, connectivity, etc.). This is the reason why it is only planned to release it in September 2017. It must be noted that the owners of an AstroPiBox Standard version will have the possibility to upgrade their system with an Advanced version case when it is available at a reduced price. The AstroPiBox TouchScreen version requires an integration with the standard Raspberry Pi 7" screen as well as a suited power supply. This is why it will only be shipped in March 2017. Will I be eligible to an upgrade of the AstroPiBox software in the future? A few months after the end of the crowdfunding phase, the first official version of the AstroPiBix software suite will be published (it will include all the fixes and enhancements suggested by the first users who have subscribed to the crowdfunding). At this time, all the persons who have acquired one of the 3 versions of AstroPiBox (SD, Standard or TouchScreen) will be eligible to a free upgrade of their Micro-SD card an will simply return it to ClearSkyLab. What will be the support policy for the AstroPiBox after the crowdfunding phase? In addition to the standard guarantee on the hardware, the acquisition of an AstroPiBox system entitles you to a free upgrade of the AstroPiBox software suite when it will be fully productized. In case the AstroPiBox software environment gets corrupted, it will be possible to request a free swap of the Micro-SD card. It is planned that the minor software upgrades of the AstroPiBox will be done automatically over the Internet. What is the difference between the Standard version and the Advanced version of the AstroPiBox? The Standard AstroPiBox version is based on a standard case from the market to host the Raspberry Pi 3. This case will be selected for its quality and will allow the user to operate the system outside in normal conditions (e.g. with a reasonable humidity level). The Advanced version will integrate a watertight case and some electronics components spécifically integrated for the AstroPiBox. These components will be in particular: a powered USB hub (in order to connect cameras that require more current than the Raspberry Pi 3 can provide), robust connectors, additional plugs to power other equipments, etc. Do not hesitate however to start with the Standard version of the AstroPiBox knowing that the upgrade to the Advanced version will be proposed at a discounted price. Which model should I chose (Standard, Advanced or TouchScreen)? The TouchScreen version is mostly intended to be used in the scope of a mobile configuration since it integrates its own screen and a Raspberry Pi in a small and portable package. It must be used close to the telescope and only requires an additional keybpoard and mouse preferably wireless (it can also be used directly with the touch screen assuming it has been properly configured initially). The Standard and Advanced versions can be used in a permanent setup or even in a mobile configuration, but they require a separate screen. This screen can be an HDMI one directly connected to the Raspberry Pi or a relmote computer or tablet running a VNC client (VN clients are available on tablets). The connection between the AstroPiBox and the remotre device is done through a local network or using the WiFi access point exposed by the AstroPiBox. From a functional point of view, the Standard and Advanced versions are similar. The Advanced version will simply be available later and will integrate in a watertight case some extra equipment (in particular a USB Hub). Should I wait the Advanced version to be sure to have a watertight case? The Standard and TouchScreen versions, without beeing watertight, have been tested at night in wet environments without noticing particular problems. It is important however to take care that humidity does not accumulate in the case if the night is very wet. Note also the Advanced version will be proposed at a very interesting price for people who get the Standard version in the scope of the crowdfunding phase. Is the shipment of the different versions of the AstroPiBox free? Shipment of all versions of the AstroPiBox is free in continental France and billed at a standard cost for Europe, United States and Australia (see the rates on the crowdfunding site).